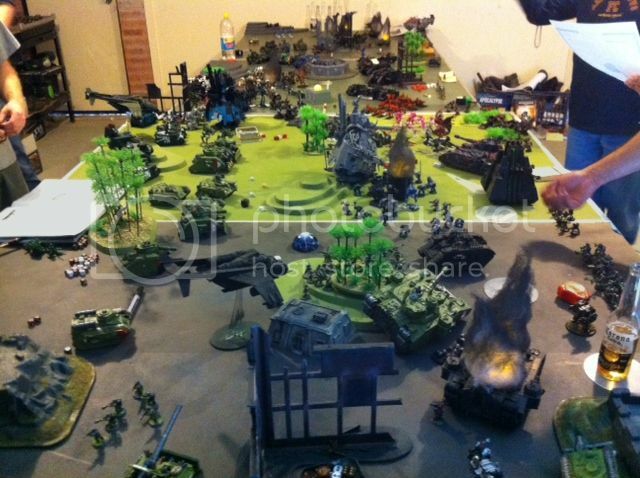 Tempest's 40K Bunker: Pulling back from the brink, and flaming wreckage markers!! 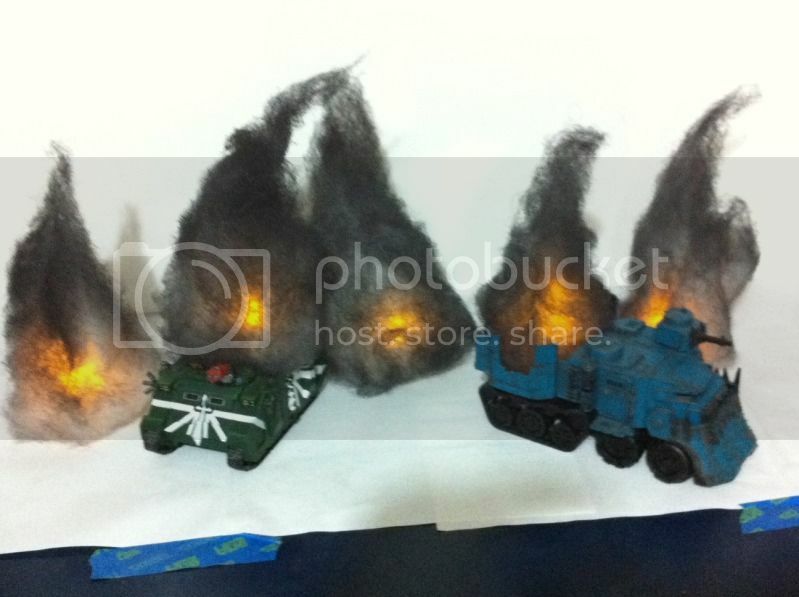 Pulling back from the brink, and flaming wreckage markers!! 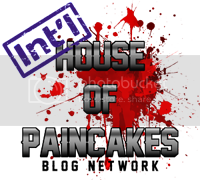 Its been a while now, a very long while so my sincerest apologies to anyone who has been waiting for a blog update. I've been relatively MIA of late for two reasons, one positive and one negative, and i thought i'd share them here to show the kind of interruptions that can befall us gamers and ruin the best laid hobby plans. My 'positive' reason is the landscaping of my house, chiefly a set of stairs running from the top of our driveway to the bottom through a previously unused section of garden. I can say proudly that all measurements were done with my trusty GW measuring tape, which now (unfortunately) refuses to spool up closed without persuasion, has some missing measurement lines and generally looks really beat up. Might be time for a new one soon, or i'll just pull it apart and have a tinker as I seem do with everything else that needs fixing!! At the time of posting this i have only to secure the pavers on top of the steps and i'm done. I have it on good authority that its equivalent to a $5000+ job if I hired landscapers to do it, and we've only spent around $500. Worth it seeing how its hard enough for me to walk up our steep driveway, let alone my 6 month pregnant wife! And onto the negative... about three weeks ago I sort of cracked it, like really bad, regarding the hobby. I think I was having an off day/week, and decided that I would sell everything. 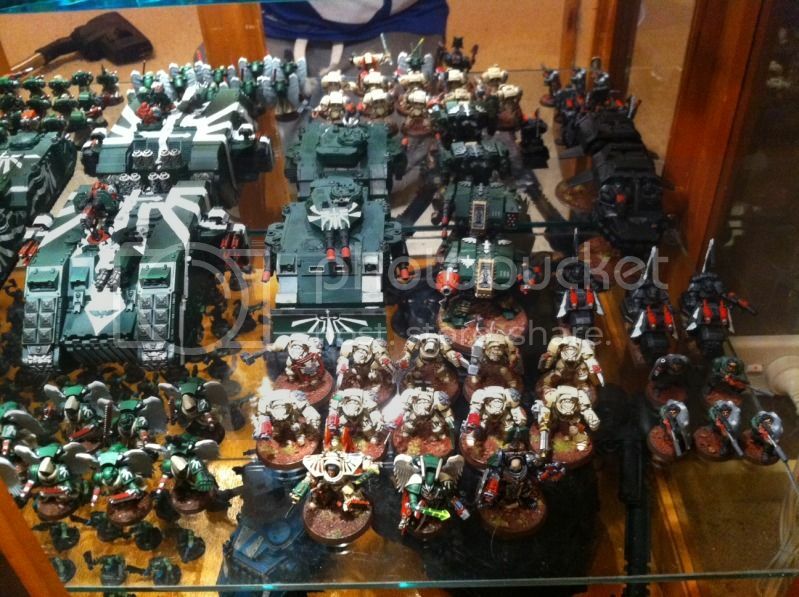 My Dark Angels, Deathskulls, Ultramarines, Blood Angels, Imperial Guardsmen, my work-in-progress scratchbuilt Warlord Titan and Marauder bomber, all my codexes, rulebooks, templates, dice, terrain, gameboards and storage cases. For some reason that now escapes me I thought that selling it all would be good for me. I had it all up on eBay, had loads of offers (not for the whole lot mind you) but I eventually pulled it back down. So why did I do it? In the time since then I've had a chance to take a step back and look at the reasons why- and here they are. Lack of time / availability for the hobby: The average age of my gaming mates would be around 28, and hence we are all relatively busy people with family, relationships, careers and other pursuits to keep us busy. We dont have the luxury of just getting home from school like the younger guys and being able to get a game in, likewise our weekends are filled with family, sports, social and work commitments. This is most definately a good thing, as it means we arent all introverted hobby weirdos but it means that getting a game, painting session or get together that much harder. My reasoning was that i didnt have time for the game anymore, especially seeing how we're expecting a baby in the next 13 weeks. My level of interest in the game varies to other people: Now I stress that this is not a negative, but its definately a factor as to why I (temporarily) wanted out. Around 90% of my gaming buddies play other gaming systems, such as DnD and Dark Heresy as well as online games like BF3. I dont have anything of the like- not for lack of funds or interest, but time (as per the above point). So where I mainly put my creative time and energies into 40K, my mates are involved across numerous other games, campaigns, online matches or tournaments. I can tell you from first hand experience that its easy to bounce from one point of interest to the other from week-to-week (or even day-to-day! ), being that building and modifying cars are my other main interest in life... so sometimes people are engrossed in something else and wont be keen for game. Again, I stress that this is in no way a negative, its just how it his. The immensity of what I still have left to complete: Right at this time I have 35 'new' Dark Angels in either black undercoat or with base colours applied and in several assembly pieces each to help with painting. Thats also in addition to the average 90 percent completion of all the painted units that im gaming with that still need doing. Same again with my Deathskull Orks- all 80 infantry/ footslogging models have had their skin base colours applied and blue clan markings, but thats it. To just put down all that green skin colour (in a fast application but great coverage thinned Foundation "Gnarloc Green" no less) took me 8 hours. The remaining armour, weapons, helmets and details for these guys will easily consume another 40+ hours, even when using more time-saving Foundation Paints and Citadel Washes. And there's also the 40K scale Warlord Titan, who is about 60% complete and has racked up around 110 hours in planning and assembly time. I still dont think he'll be done by the end of this year, although I reckon I could happily finish him off given a week off work! (Which wont happen). Stagnation regarding my current armies: While the Orks have a relatively recent Codex, the Brother-Marines of the first Legion are still stuck with a codex from early 2007 that is now massively overshadowed by the more recent power-armour tomes. Yes, there has been FAQs to even stuff out- we now get 3+ Storm Shield saves and two shots from a Cyclone Missile Launcher, but not much else to even out the playing field. 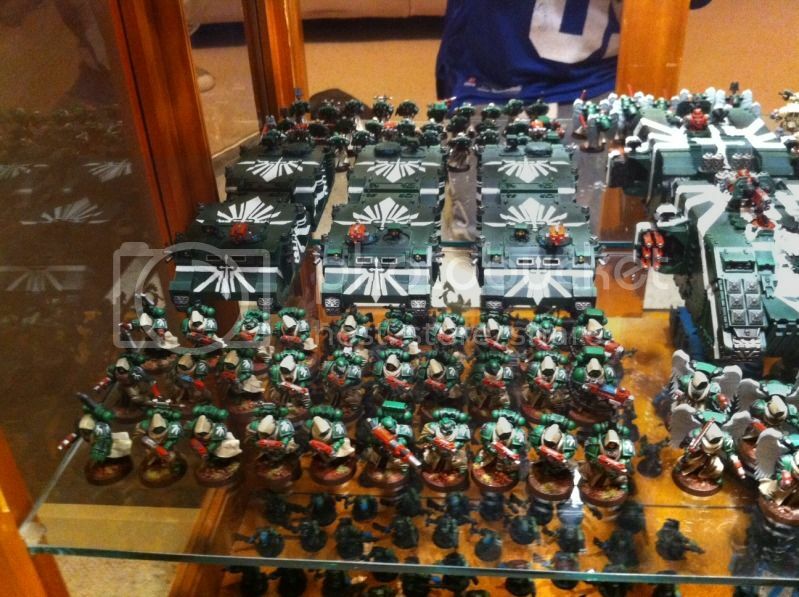 The points values and squad size and wargear restrictions are the hardest to work with, as most power armoured forces can now bring more to the table for less, although, I can happily say that my breadth of experience with the Dark Angels codex and forces means that I can usually drag out at least a draw against the more competitive list builds out there. I suppose my final gripe on the subject is that the newer codexes have a lot more toys to fill your lists with- I want Thunderfire Cannons, specialised Veteran Squads and more Dreadnought variants but its just a waiting game. And so for now my current DA squad buildups have been limited to the core elements that will not change- tactical and devastator squads. So thats the main bunch of reasons for my little meltdown and near-miss regarding full hobby sellout/meltdown. In hindsight I can see that I just jumped in making a snap decision to burn all my bridges and move on and that I would have regretted this move immensely had it all sold. 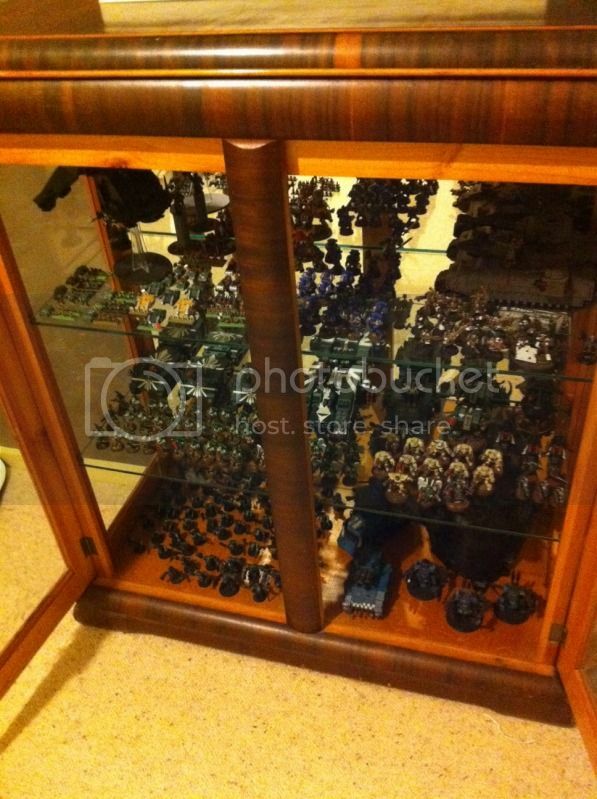 Much better that my minis spend their time between games locked up safely in a display cupboard/case than end up in someone else's posession at a massive loss to what i've put in. So yeah, i was going to sell all this... and more! 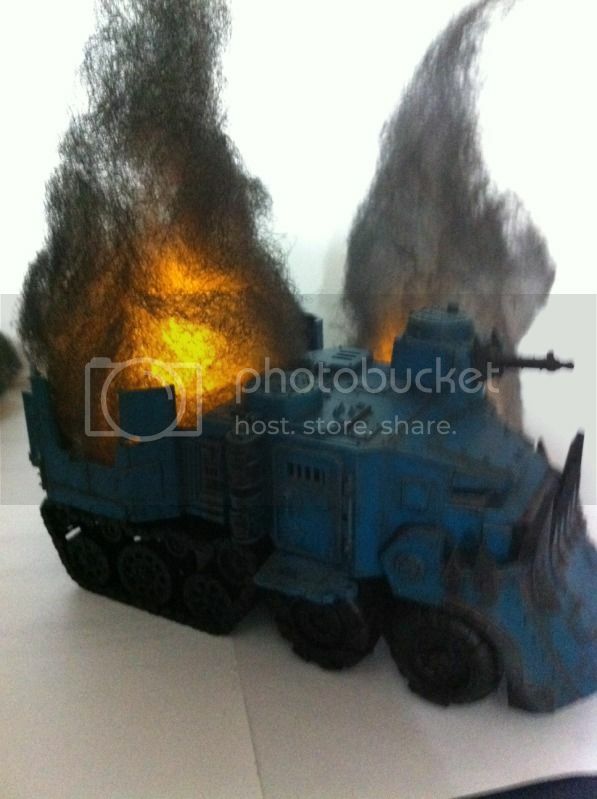 For those of you who saw the writeup regarding the 50,000pt Apocalypse that was held late November last year you might remember seeing and hearing about the "flickering LED candle" flaming wreckage markers I built for the event. I was sick of just putting a dice on the roof to show the tank/dread/unit as wrecked, and had recently viewed a couple of forum threads and youtube videos telling you how to make these up, so in a flurry of post-Apoc creativity I gathered all the items up and got building. The results are fantastic to be honest! I'll have a proper tutorial up soon with step-by-step details and pics, but for now here's a few showcasing the flaming markers, as well as a video showing their flickering effect as well. 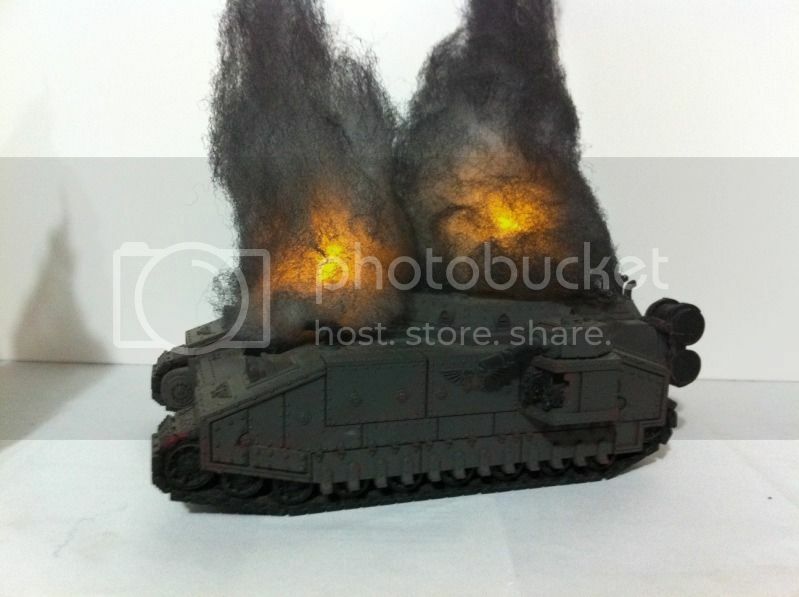 Burning a Baneblade, looks convincing doesnt it! 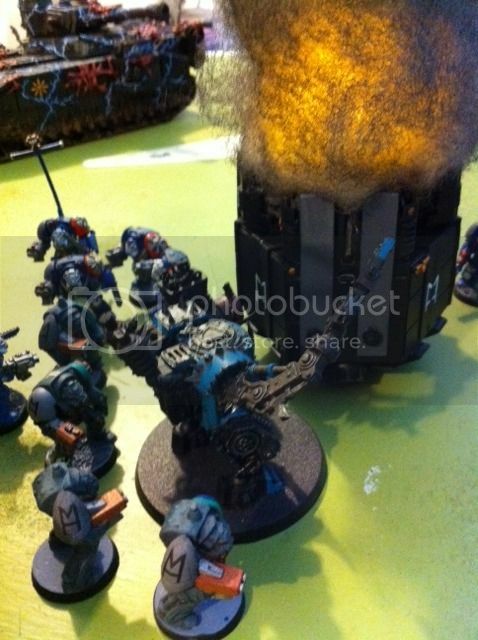 An Ork Battlewagon has taken a direct hit- the boyz are now toast! Everything is on fire! this kind of grouping is great to represent bombing runs. So thats all for now, as always i appreciate your thoughts and feedback. Hey man! Great, and insightful blog update! SO SO SOOOOOO glad that you didn't sell the armies and other goodies. Yeah, it's been painful trying to get a game in (and I am the worst offender, too), but damn they are fun when we actually get to organising one! Glad you liked the flaming markers!! Not my own idea, but i think i've refined them into a more durable item than those i've seen other people making online. Definately gotta get an instructional post up on how to build them.